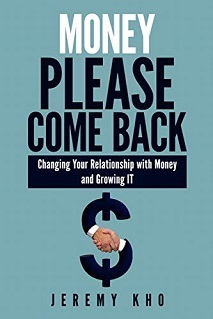 Money Please Come Back gets down to the nitty gritty of why most men and women have trouble properly adjusting our relationships with money. The book clearly examines common problems often associated with finances. It often affects health creating more stress, avoidance, confusion, loss of sleep, and feeling we are a failing casualty of modern life. The author steps the reader through a foundational blueprint to achieve maximum earning and savings outcomes. You get solid, proven strategies for earning more, spending only on the things you really want and need, with plenty left over to save and invest to grow your personal capitol to make future dreams come true. When you consider money is the number one reason individuals feel depressed and couples fight, Money Please Come Back should be required reading for anyone who wants to quickly improve your life, happiness, and standard of living.